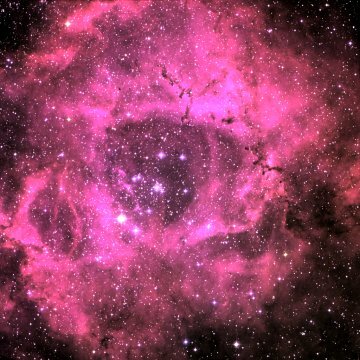 This is the Rosette Nebula, one of the most beautiful sights in the Milky Way. The star cluster NGC 2244, part of the Mon OB2 association, contains about 2000 stars and forms a blister at one end of the 130 thousand solar mass Rosette molecular cloud. About 30 of these stars are hot enough to ionise the nebula. Avedisova places the Rosette nebula in star formation region SFR 206.30-2.11 with 114 components, including 6 masers, 34 infrared sources and the radio source W16. Near by the Rosette molecular cloud are two smaller clouds associated with the HII regions Sh 2-280 and Sh 2-282. You can find out more about this region in the Mon OB2 section of the description of the Fox Fur and Rosette (210° - 200°) sector in the Commentary on the Galactic Plane. An astonishing image that shows the entire Monoceros region in one image (including the Fox Fur nebula) can be found here.